Shake Shack announced Tuesday that it will be serving breakfast -- which is only available at two other places in the US -- at its Union Station restaurant beginning Monday, May 11th, offering a glimmer of hope for your totally fun morning commute through the station. 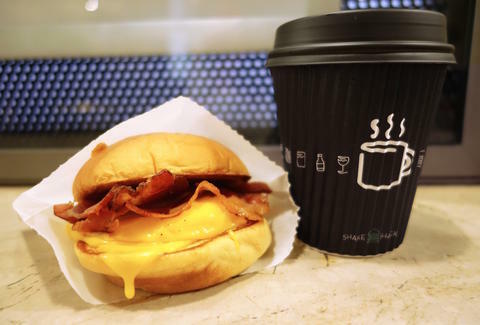 From 7am to 10:30am, you'll be able to get your hands on a Bacon, Egg N’ Cheese; Sausage, Egg N’ Cheese; or an Egg N’ Cheese, which have previously only been available at far-off Shake Shacks at JFK Airport, Grand Central Terminal, and Dubai International Airport. The lineup of sammies are made with Niman Ranch cage-free eggs, melted American cheese, and come served on toasted potato buns. The breakfast menu also includes coffee and tea because, you know, commuting just isn't commuting without having to juggle a hot coffee cup on a crowded platform, too. But who are we kidding? All that actually matters is which breakfast sandwich you choose. Tony Merevick is Cities News Editor at Thrillist and can't think of a better way of passing through a train station than while chowing on a breakfast sandwich. Send news tips to news@thrillist.com and follow him on Twitter @tonymerevick.